Dial Control from low, 1-9, and high. "The World's Safest Heated Blanket"
Traditionally all UL listed warming blankets in North America operated at 120 volts. 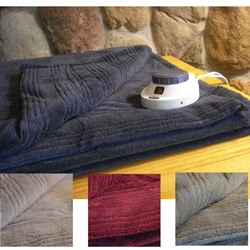 Perfect Fit Industries a premier home textiles and bedding manufacturer, designed and created this heated throw blanket to operate with non-hazardous low voltage. This technology has allowed them to create the safest electric heated throw blanket ever produced. Inferior fabric. Bulky and uncomfortable wires can be felt through the blanket. Smooth Soft 100% Micro-Fleece Polyester. Heating wires so small, they're virtually unnoticeable to the touch. This is the only heated blanket that maintains its original size after being washed. A patented Safe & Warm® technology - the ultimate in safety. It has an easy to read, easy to turn, non-slip computerized controller . It has smart preheat which automatically pre-warms to your dial setting . For safety the Heated Blanket automaticly shuts off after ten hours. It is suitable for all season use, even without using the heating feature. Smooth Soft 100% Micro-Fleece Polyester - Non-pilling fabric. The automatic preheat feature warms to your dial setting in about 15 minutes. A low voltage blanket will create enough heat to keep you warm and comfortable. 1 controller for twin and full, 2 controllers for queen and king (to adjust temperature on each side of the bed. Do not use this product on top of a heated mattress pad. Full - 77" x 84"
Queen - 84" x 90"